With the Big Game coming up tomorrow I thought I needed to get another good game day recipe out. These Low-Carb Chicken 'Nachos' have been something that I've been working on for a month or two now, trying to get the spice level right and the cooking method down perfectly. 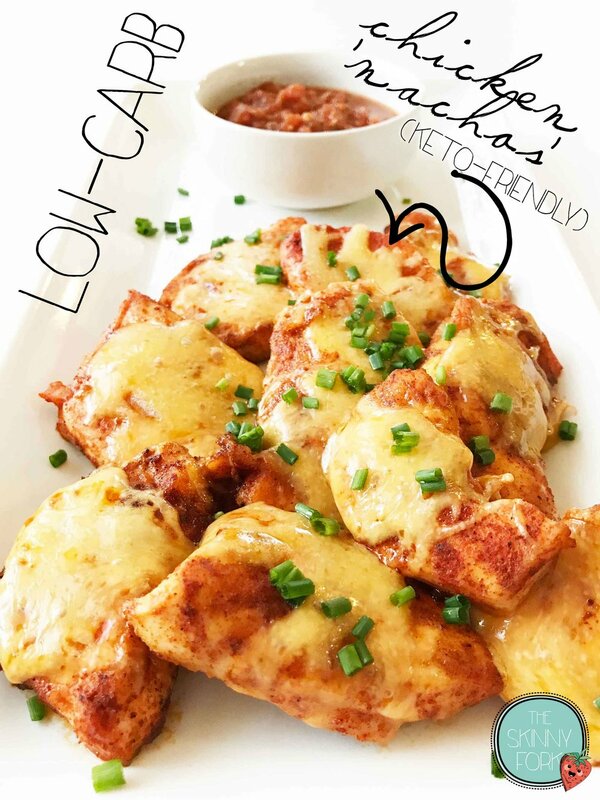 These Chicken 'Nachos' are really more of Chicken 'Not-Chos' since there is no chip involved here. Instead, the entire nacho is based on the pieces of chicken themselves. To pack in as much flavor as possible, I started these off with seasoning. A LOT of seasoning too. Let's face it, chicken breast can be a little moot. So, I wanted to be sure it had all the help that it could get here. Once these 'nachos' are cooked, they are loaded up with plenty of cheesy goodness and even some chives to really get that nacho look and feel. I can say that I didn't miss the chips at all here. I was perfectly happy loading these chicken 'nachos' up in my traditional manner with salsa, guacamole, and even some plain greek yogurt/sour cream. These would definitely make a great addition to any game day spread. To keep fingers clean, be sure to have some toothpicks on hand and plenty of dip options. Like I said, you can't go wrong with the usual; salsa, guacamole, sour cream, and maybe even some queso if you're feeling extra naughty. Preheat the oven to 350 degrees F. and line a baking sheet with foil or a silicone baking mat; set aside. In a small bowl, mix together the 1 1/2 Tsp. Salt, 1 1/2 Tsp. Smoked Paprika, 3/4 Tsp. Chili Powder, 3/4 Tsp. Cumin, and 1/8-1/2 Tsp. Cayenne. Place the 1 Lbs. Chicken Breast Tenders into a medium bowl along with the 1 Tbsp. Extra Virgin Olive Oil and the seasoning mix. Toss (or use clean/gloved hands) to coat the chicken with the oil and spices evenly. 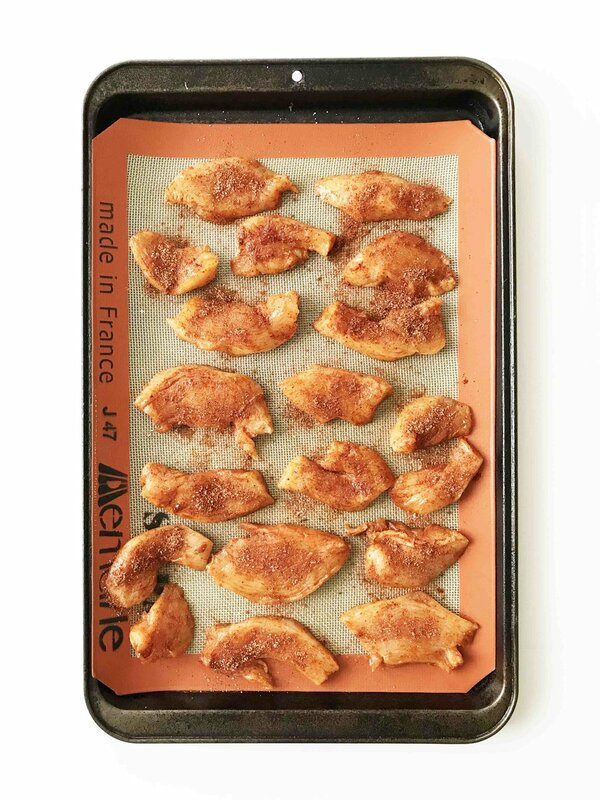 Set the chicken tenders out in a single layer on the prepared baking sheet and place it in the oven to bake for about 10-15 minutes; flipping over halfway through the cook time. 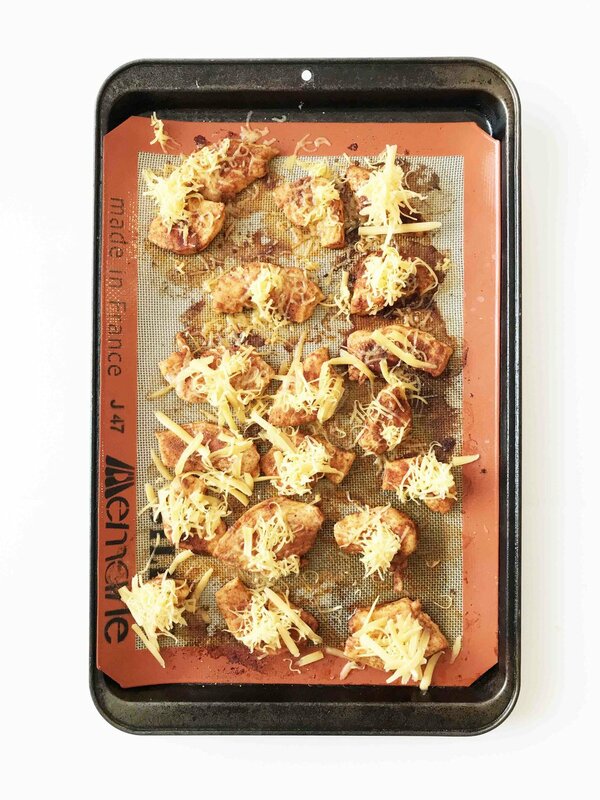 Once the chicken is fully cooked, up the oven temperature to 425 degrees F and top each 'nacho' with some of the Grated Cheddar Cheese divided evenly among the pieces. Place back in the oven to bake for another 5 minutes or until the cheese has melted. Once done, remove from the oven and top with the 2 Tbsp. Diced Chives. Serve right away with your choice of dips and enjoy!